Top: Tyler Wells with Pep Fernandez of The Inland_Sports Show. Coyote baseball players Tyler Wells and Will Ouellette both signed with professional baseball teams this June. Wells was drafted by the Minnesota Twins and was assigned to the Elizabethton Twins, the rookie affiliate based out of Elizabethton, Tenn.
Wells has been one of the Twins starting pitchers, continuing the role he had with the Coyotes. Ouellette was signed on as a pitcher by the Toronto Blue Jays as a free agent. “I love the fact that this is my job now,” said Ouellette. “I don’t have to worry about anything else but baseball, so all my attention goes towards it,” he continued. Ouellette previously played shortstop for the Coyotes, but added pitching to his resume in his final season with the Coyotes. Ouellette was assigned to the rookie Gulf Coast League (GCL) Blue Jays and has been pitching in relief as he did with the Coyotes. As of July 20, Wells has pitched in three games, starting all of them. Wells has 17 strikeouts over 10 innings of work for the Twins. He ranks third in strikeouts on the team, behind only two other players. Ouellette has pitched in four games, all in relief. He has struck out three in four and one-third innings. “Well, we’re about a quarter of the way through the season right now and currently on a 12 game winning streak, so it’s going well,” said Ouellette. The win streak ended on July 18 at 15 games, but the Blue Jays lead their division with a record of 19 wins and just four losses. 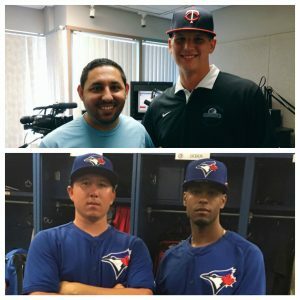 As professional baseball players, Wells and Ouellette have to become accustomed to new challenges. Wells noted a difference in skill level. “The biggest challenge I’ve come across so far is realizing how many people speak Spanish,” said Ouellette. “I didn’t think it would be that many, but more than half of my team speaks it and because of that, my Spanish has improved and continues to improve everyday,” added Ouellette. As the first half of the season winds down, Wells and Ouellette take a look at the way they hope their rookie seasons will turn out in the end. “I would love to be promoted to the [class A short season] team, in Vancouver,” said Ouellette. “However, if that doesn’t happen, I’d love to win a GCL championship with my teammates,” concluded Ouellette.